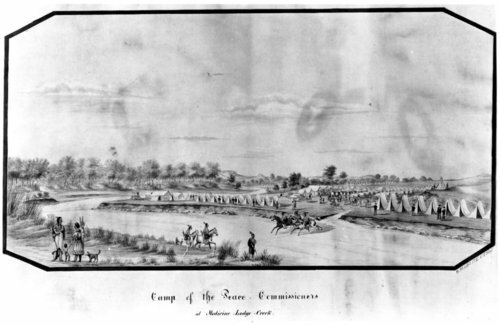 A copy of the painting by Hermann Stieffel titled, Camp of the Peace Commissioners, which depicts the location of the Medicine Lodge Creek treaties with various Indian tribes in late October 1867. The original painting can be found at the Smithsonian Institution. Funds for digitization provided by Mr. Steve Peckel in memory of William Chalfant.